When it comes to finding a place to live, house-hunting is incredibly stressful. However, what happens if you’re a dragon who finds themselves homeless? 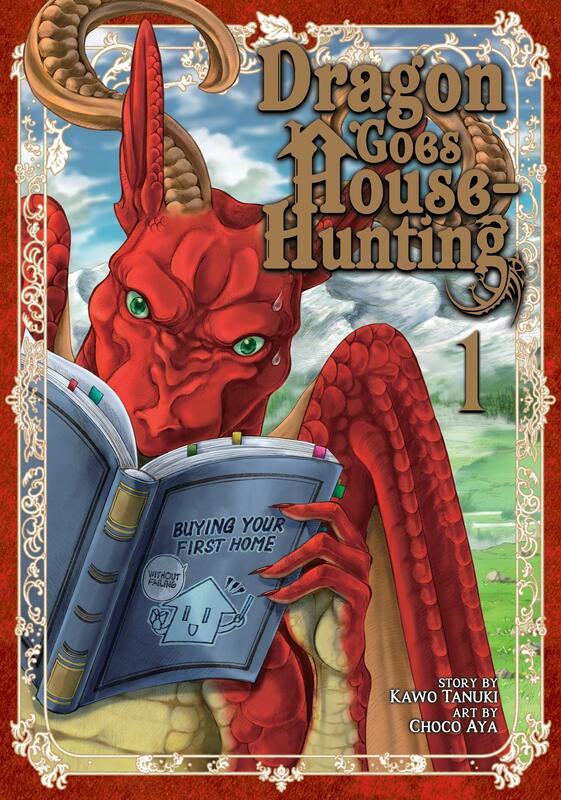 That’s the question we’re here to answer today with the release of Dragon Goes House-Hunting Volume 1! Let’s dive in and see how difficult it is finding a place to call home when you’re a mythical beast. Our story revolves around a rather lazy dragon known as Letty. Letty is kicked out of his family’s home after failing to safeguard some dragon eggs. Now Letty must find a new place to call home. This world isn’t kind to dragons, however, with adventurers looking to hunt them down for meat and others wishing to use their remains to produce armour, so Letty has his work cut out for him! It seems as if the whole world is against our poor hero, but before long he’s directed towards a mysterious architect (who also appears to be a demon lord?!) known as Dearia. During his search, Letty is attacked by a pack of bloodthirsty adventurers and subsequently saved by a passerby, who coincidentally turns out to be Dearia! Once introduced, Letty quickly requests that the architect help find him a home. Dearia agrees, and from there the two go hunting for a dragon’s perfect home. Despite the amount of fantasy stories that I follow, this is one of the first manga I’ve read that takes a mythical creature (like a dragon) and tells a down-to-earth and relatable story. Us humans struggle with house-hunting, so why wouldn’t dragons too? It’s surprisingly fascinating to read about the problems Letty deals with as they’re much stranger than the challenges we’d typically face. He wants to live out his days peacefully, away from those who wish to do him harm, but at the same time he doesn’t want to be lonely. One of the places Dearia suggests is a dungeon, which Letty would live above and anyone wishing to harm him would be taken out by the traps on the lower levels. Unfortunately, to reach the livable quarters, Letty too must get past all the traps. It’s really troublesome being a dragon. It seems like it might be some time before Letty finds a place to call home, but in the meantime the bond between him and Dearia is only growing. The two play off one another incredibly well. Dearia isn’t fazed by anything and does his best to find Letty a suitable abode, while Letty is very shy and a bit of a scaredy cat. The two are exact opposites, which means they draw the best out of one another. They’re well characterised, and it’s obvious that there’s a lot more for us to learn about both of them going forward. For a fairly simple concept, I was worried that Dragon Goes House-Hunting wouldn’t feel viable for more than a volume. However, by the end of Volume 1, I was sold on the idea of further instalments in this series. Mangaka team Kawo Tanuki (story) and Choco Aya (art) have created enjoyable story arcs around each home Letty visits and the creatures he interacts with – enough so that I’m looking forward to seeing where we go and who we meet next. The artwork for this volume is also very striking, with a very realistic but charming look. Rather than going for a chibi ‘cute’ dragon, Letty is much more true to life and extremely well detailed while still having a dash of cute to him. The human characters in this book were also drawn fairly true to life, and although Dearia is very much a ‘pretty boy’ he’s not out of place among the ruffians of the adventurers. My only real complaint about the art is that panels can sometimes be overcrowded, making it difficult to work out whose speaking in a given scene. Having said that, every scene is well detailed and there are some wonderful two-page spreads in this volume. Dragon Goes House-Hunting has been brought to English thanks to Seven Seas Entertainment. Translation has been handled by Nan Rymer and reads well without any issues. I especially like how smoothly most of the references have translated across (notable examples being the hunters and their feline friends, which appears to be a reference to Japanese game Monster Hunter). On the surface Dragon Goes House-Hunting may seem like an odd concept, but what we have here is a charming story about what it means to look for a new home. While the problems we face compared to a dragon are quite different, it still manages to be relatable – and even if you can’t empathise with Letty’s situation, the charming cast of characters will see you through.